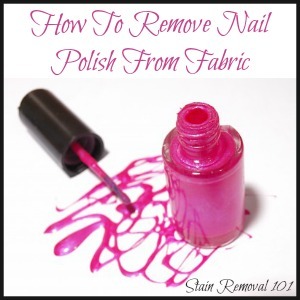 Below I've gathered tips for how to remove nail polish stains from fabric and clothing, including a couple of videos from around the web. There is almost always more than one way to remove spills and spots, but I will admit that nail polish, since it is a type of paint, basically, is one of the toughest things to remove. This difficulty is compounded by the fact that there are lots of different colors of polish, and many different brands, all which have different formulas and ingredients. That means what works with one stain may not work with another, and you need to be willing to experiment, try different methods, and unfortunately to even give up when sometimes the mess just won't come out. I'm always looking for more tips for how to remove these spills though, including from various types of fabrics. Therefore, if you've done something that has worked for you, make sure to share your tips here, and I will add them to the page. So, without further ado, scroll on down to see the tips which I've already compiled. I hope they help! Join in and write your own page! It's easy to do. How? Simply click here to return to nail polish stains. Below is a video showing a nail polish removal stain tip for clothes. The tip is pretty obvious -- use nail polish remover to get rid of the spots. The video itself is pretty helpful, however, because it shows you the step by step method for doing it. The video cautions that some nail polish removers harm clothes, so try yours in an inconspicuous area and use a different remover if the first one harms the clothing, or removes the color from the fabric. However, the video does not explain what the difference between various removers is, or what can cause the harm to clothing. The big difference between nail polish removers is whether the non-oily ones have acetone in them, or not. Although it is generally considered harsher I still recommend using acetone to remove nail polish stains because I have found it typically works better. However, acetone can be harmful to certain types of fabric, such as acetate, which it will melt, for example. Acetone can also remove color from certain types of fibers. Therefore, you can also try to remove nail polish stains from clothing with non-acetone nail polish remover, because it is also designed to remove nail polish. Acetone is actually uses for lots of stain removal and cleaning uses throughout your home. You can see additional acetone uses here, or share how you use this versatile product around your home. 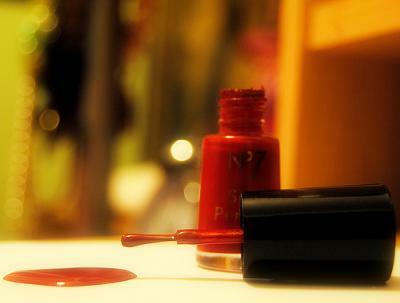 Stain removal of nail polish can be difficult, because nail polish is basically paint. If you don't want to use acetone to try to remove the stain per the suggestion above, because you're concerned, for instance, about it removing color along with the polish from your fabric your ways of removing the stains are more limited. Below is a video discussing some ways to remove these stains from other fabrics (and also carpet) without using acetone. I'd love to hear from readers telling me how they've removed these spills and drips from their clothing. You can share your tips here, and I'll make sure to add them to the page. I've tried the AWESOME product, acetone polish remover, Goof Off and a cleaning solvent. Nothing worked. I think my bedspread is ruined. I've blotted, rubbed with a clean rag, scrubbed with a toothbrush, nothing. I'll probably rub a hole in it. Got purple nail polish on fav jeans (light gray). How do I remove it? We have a cleaner around the Massachusetts area called LA's Awesome. It is found in the dollar stores around town.This stuff is pure magic!! It takes everything and anything out of anything! Old or new stain, it does not matter from chocolate, red wine to blood it will take it out!! I have this stuff on hand ALWAYS! And for $1 how can you not have it!!!!! I need to remove dried nail polish from fabric, and nail polish remover will not touch it. Thanks. Out here in Texas we have a cleaner called Awesome. I don't know if it's sold everywhere but I know the Dollar General and Walmart carries it. It gets anything out. I have a group home and some one spilled nail polish. It came up with a little soaking and scrubbing. Not a sign of it.